Lecture by Professor James P. Smith "Irish immigrants and their progeny around the world"
Thursday, 12th May 2016: We were delighted to have Professor James Smith join us in celebrating 10 years of TILDA. Hollywood movies often portrayed the Irish as a poor and uneducated race of people. Yet like so many other Hollywood storylines, this image is just a myth. 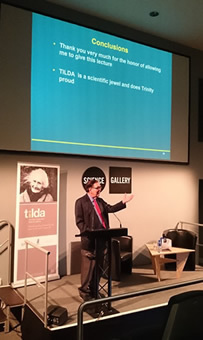 In fact Irish migrants to the US during the first half of the 20th century were on average as well educated as other European immigrants to the US, according to Professor James Smith, who delivered the lecture "Irish Immigrants and their Progeny around the World" in Trinity College Dublin to mark the 10th anniversary of TILDA (The Irish Longitudinal Study on Ageing). In addition to comparing whether Irish migrants to the US were more or less educated than the Irish who stayed at home, Professor Smith, the son of an Irish mother who emigrated to the US, examined how the children and grandchildren of Irish migrants to the US did in terms of their education. Did they receive more education in the US than they would have received if the original migrants had stayed at home in Ireland? The answer is no. Professor Smith, Distinguished Chair in Labor Markets and Demographic Studies at US-based policy-research institute RAND, visited Trinity to help celebrate the 10th anniversary of TILDA. He has served from the start of TILDA as chair of the International Scientific Advisory Board and has played a pivotal role in helping TILDA be a success. Professor Paul Browne, Head of School of Medicine, welcoming Professor James Smith said: "We are grateful to Professor Smith for being incredibly generous with his time and expertise, and in particular for his mentorship of younger researchers at TILDA and being an inspiration.